Everyone gets angry, but some people manage anger better than others. When channeled properly, anger is a positive and healthy emotion that relieves tension and stress, focuses decision-making, and results in getting action. But if it gets out of control, anger can seriously damage your: physical health, mental health, relationships, career. Worst of all, anger can lead to costly misdemeanors and felonies that result in court and jail time as well as a damaging criminal record. Indeed, anger can kill you in many ways! 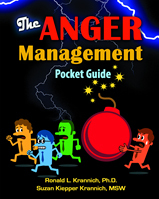 Designed for better controlling one’s s anger, this powerful little guide covers it all: Examines the nature of anger; Surveys 11 key myths and realities; Shows how anger differs with men and women; Identifies major anger triggers and costs; Specifies self-help techniques; Reveals how to get professional help; Offers a commitment-to-change contract. Two sections on self-help and getting help cover everything from reducing stress, joining anger management classes, and forming a support group to finding a good therapist, taking medications, and even acquiring a loving pet. It also lists dozens of useful anger management resources – books, DVDs, games, programs, and websites. Jam-packed with revealing self-tests, examples, illustrations, exercises, tips, techniques, and resources for changing attitudes and behaviors that lead to creating a new anger-free you. A terrific handout for counselors and other professionals to give clients who are struggling with anger management issues, especially those experiencing co-occurring disorders (substance abuse, depression, anxiety, OCD, phobias), and/or those who are incarcerated with anger, rage, and violence issues.